This post is by Associate Professor Evonne Miller, Director of QUT Design Lab, Queensland University of Technology. There is no doubt that supervising your first thesis student can be quite terrifying. The following thoughts are common: “OMG, how do I run a supervision meeting?”; “how can I teach them to write/research when I am only learning” and “what if they don’t find anything interesting in their research and the examiners slaughter them?”. Luckily, we can actually turn to turn to Ikea for guidance and inspiration. When you first start supervising research thesis students, the feelings are very similar. It is quite easy to feel a little overwhelmed by the enormity of the task… a bit like when you are faced with a box of mystery parts from Ikea (surely that screw is not THAT important, you wonder?). But, before you get too stressed out about the responsibility and caught in a cycle of destructive thinking re the responsibility of supervision (aka, if they fail their phd, it is my fault..! ), please try and remember three key points we can take from the ‘ikea feeling’ : (1) there are instructions; (2) a thesis is a journey; and (3) there is a team (aka, you as their supervisor are just one person on this journey; important, yes, but not the only resource). First, and this is critically important, start by reading the instructions. This is always true, whether you are assembling something from IKEA or supervising a research student. Fortunately, there are many wonderful books, blogs and resources you can engage with about the supervision journey – as well as this blog, your university will offer training. Even simply pledging to read one book a year (I recommend with starting with a book on writing – e.g., Helen Sword’s “Air & Light & Time & Space: How Successful Academics Write”) or subscribing to some blogs (following and reading some posts on the https://thesiswhisperer.com will keep you in touch with the student perspective), will help improve your supervision practice. The very first thing you need to do, however, is familiarse yourself with your university’s processes, milestones and timelines. Making friends with your higher degree research administrative team is ALWAYS a good first move – as they are super familiar with policies, processes and exemptions. There might be a few missing parts, but generally, most people are able to assemble their IKEA furniture. In a similar way, although the instructions and the end goal are the same, everybody has a different research thesis journey. The journey will often differ from the original plan – and as supersavers, we need to accept that is OK. Often, the research method, question and approach may change – but what matters most is that, at the end of the day, there is a final output: a completed thesis, with a coherent narrative. The end result will often look quite different from what was planned, and that OK.
As the supervisor, however, I strongly believe it is your job to project confidence, optimism and direction along a path the student can follow…. your student needs to know that you believe in them, and will work with them to produce a good (passable) thesis. If you have persistent doubts about that, then you must seek advice about the best path forward. Finally, just as you might need a team to help assemble your IKEA furniture, it is likely you will draw on and build a team as your supervise a research thesis student. You cannot be an expert on everything, and you should seek to build a team. First, the co-supervsiors. They play a critical role, not only in terms of special theory, methods or literature knowledge, but their personality and approach to supervision. There is no doubt that having ‘good cop, bad cop’ roles might help in some situations, or just that extra pair of eyes to provide feedback, and insight to guide decisions. So whenever possible, make use of associate supervisors. Second, use all the resources your university offers. As well as the higher degree research administrative team, the library will typically run seminars and workshops designed to help students and supervisors. Attend them. Get to know the people working in the space of higher degree research supervision, and attend the activities. Even something as simple as committing to a regular weekly SUAW (shut up and write) session can be a way broaden networks and knowledge. Third, your team might also include a critical friend, as discussed previously on this site (https://thesupervisionwhisperers.wordpress.com/2018/06/19/dancing-around-the-edges-of-supervision-without-stepping-on-anyones-toes/), someone who can support your student in a different way. Finally, don’t forget – at the end of the day, completing the thesis is up to one person: the author, your student. You can support them as much as you like, but they are ultimately in the driver’s seat. Thus, although very important, the supervisor is just one person on this research thesis journey.. but by using the many resources available to improve and develop your own supervisory practice, you will help make the research thesis journey much more enjoyable (for both you and your student). *Acknowledgment: I was reminded about the ‘ikea feeling’ – looking at a box and freaking out – thanks to a post by Copyblogger, who teach and blog about (quote) how to create “killer online content – not bland corporate crap”. See: http://www.copyblogger.com/about/. 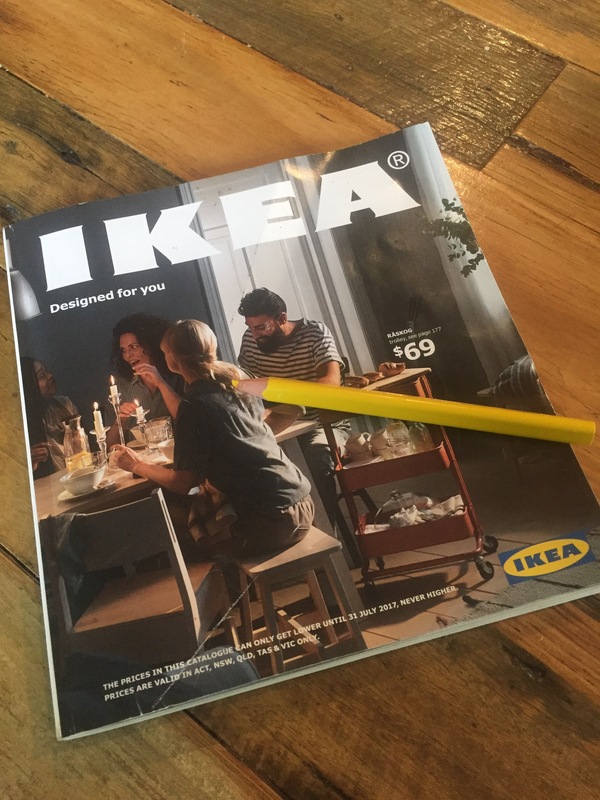 The image is of an Ikea catalogue sitting on Evonne’s kitchen bench. Previous Feeling Stressed? Tip – its DESSERTS spelt backwards, so treat yourself! Excellent piece, Evonne! There are a number of things here I’ve said, but not as well as this, to colleagues beginning to supervise for the first time. Loved the typo ‘supersavers’!